This pretty much sums things up as to why America and the world in general is ailing today! Short, but not so sweet! Keep in mind that all of this “cancer growth” is facilitated not by “tax dollars” – but by the Federal Reserve Note Payable – the world’s “reserve currency’. GREAT NAME! Enjoy this wonderful three minute sermon! NSA + DARPA + “Progressives” = DEEP FECES for Honest Americans! Sadly, the protest and the grass-roots coalition that formed it, has been successfully sabotaged and so, there will be no event. The enemy, so very skilled at dividing and conquering all opposition to their agenda via forked-tongue bribery, ego-stroking, and personal character assassinations, scored yet another victory. For the record, I have been personally maligned and my character attacked in a most vicious and hate-filled manner. Again, the double-minded “Progressives” are very skilled at brainwashing not only the masses, but also key individuals – making them believe a lie. These ravening wolves march in the streets and hold rallies for the misaligned and downtrodden LGBT segment of society, as well as promote the RIGHTS of “Illegal Aliens” – but have absolutely ZERO tolerance for anybody who dares to 100% believe in, and promote the Holy Bible, who actively subscribes to physical and emotional HEALTH THROUGH NUTRITION instead of chemical drugs and toxic vaccines, and who in the process openly and willingly chose to reject the brainwashing of ACCREDITED post-graduate, B’nai B’Rith-authored post-graduate curriculum and who instead thinks outside the proverbial box. Only one word comes to mind for such warped creatures, and that word is: HYPOCRISY! Unfortunately, they have loads of Federal Reserve Bank Notes to spend, and also enjoy lots of “credibility” with the Mainstream Media! Even the majority of my fellow “conservatives” roll their eyes and mock me when I try to warn them of the level of technological sophistication now being deployed against “We The People” by these godless minions directing the NSA. They don’t want to hear about Yottabytes and Quantum Computing capabilities. They don’t want to hear about nano-bot microchips that are so miniscule that they can pass through the hypodermic syringe “snout” of a micro-drone mosquito fleet that is set to be deployed against the “People” in the very near future, (if they haven’t already”). They don’t want to hear of the new lab-virus horrors that can be injected by the hypodermic “bite” of their computer-controlled and interfaced “bugs”. Yet, they do indeed exist compliments of DARPA! The picture below is NOT make-believe!! Don’t mess with the Irish – the PURE BLOOD of Israel – Mr. Obama!! (They are the TRUE ISRAELITES, not the phony KHAZARS whose backsides you have been kissing since 2008). Listen to the auburn-haired, blue-eyed Ms. Clare Daly, in her righteous indignation take a pound of flesh from the “Hypocrite of the Century” Obama and his snooty wife Michelle during a session of the Irish Parliament. Look at the sick look on the face of David Cameron as he realizes he just got a dose of good old TRUTH! Man, what I wouldn’t pay to see her and Nancy Pee-loosely square off in a debate! That would make millions on Pay-Per-View, I would guess! THIS VIDEO SHOULD GO VIRAL!!!! Ms. Daly is right on point! Email her at: http://www.claredaly.ie/contact/ and tell her you are proud of her!! S and British intelligence agencies have successfully cracked much of the online encryption relied upon by hundreds of millions of people to protect the privacy of their personal data, online transactions and emails, according to top-secret documents revealed by former contractor Edward Snowden. 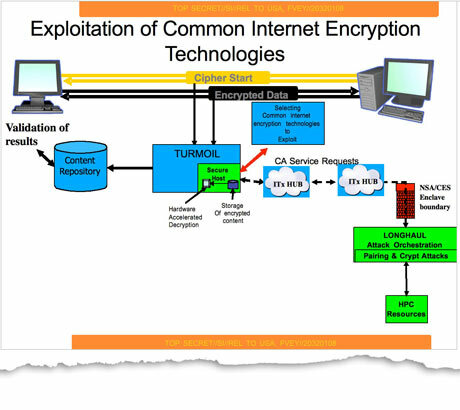 A 10-year NSA program against encryption technologies made a breakthrough in 2010 which made “vast amounts” of data collected through internet cable taps newly “exploitable”. The NSA spends $250m a year on a program which, among other goals, works with technology companies to “covertly influence” their product designs. The breakthrough, which was not described in detail in the documents, meant the intelligence agencies were able to monitor “large amounts” of data flowing through the world’s fibre-optic cables and break its encryption, despite assurances from internet company executives that this data was beyond the reach of government. 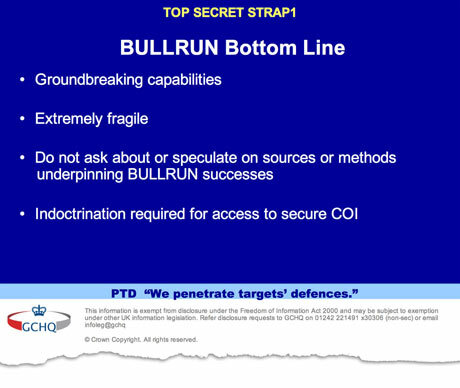 “Project Bullrun deals with NSA’s abilities to defeat the encryption used in specific network communication technologies. Bullrun involves multiple sources, all of which are extremely sensitive.” The document reveals that the agency has capabilities against widely used online protocols, such as HTTPS, voice-over-IP and Secure Sockets Layer (SSL), used to protect online shopping and banking.